This trail network is a hidden gem!! We only know of a few trail runners that have been on these trails that were made by some friendly mountain bikers. You will be pleasantly surprised for sure!! For the most part, these trails are fast and flowy singletrack...with some technical sections thrown in for good measure. There are a few slower and more technical sections (very short though) thrown in there to keep you on your toes. The course will be predominantly an "out and back", but there is a 1km loop at the far end along Sandy Lake before you make your way back towards the start/finish. 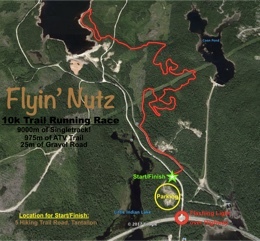 The Flyin' Nutz course consists of 95% single track and 5% ATV/logging road!! Online Registration will close November 9th at 3pm. Registration includes a Flyin' Nutz LONG SLEEVE SHIRT if you register by October 14th, 2018! This goes for volunteers as well. *The deadline for the shirt order will be October 14th at 6pm...so register before then if you want your shirt! *Race day registration is available, but you will not be entered in the draw for prizes and you will not get a shirt. *Sorry, but no refunds and no doggies on the course.